These bowls are the perfect meal to help stay on track when life gets busy! 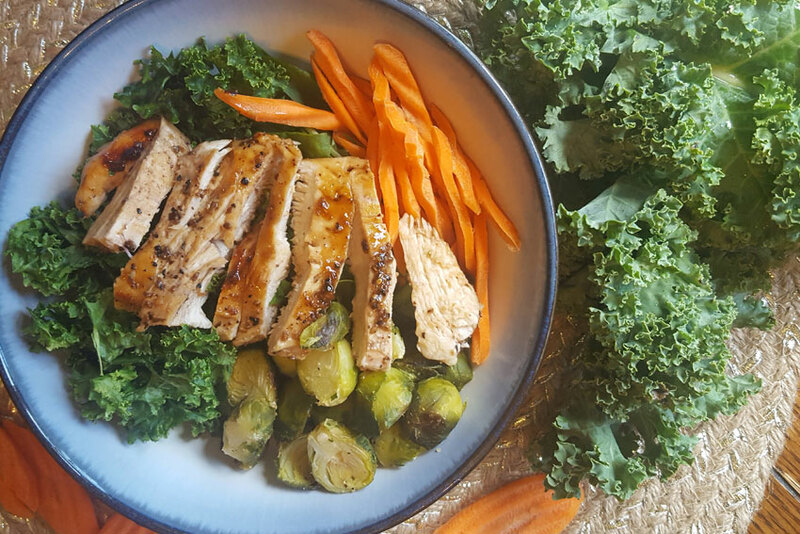 Throw together your favorite complex carbs, vegetables, and lean meats into a bowl and voila! A fully balanced, superfood-packed meal. • As many vegetables as possible! 1. Cook your favorite complex carb as directed. I used quinoa. 2. Toss your vegetables in seasonings, spray with cooking spray, and roast in the oven at 400◦ for 15 minutes. 3. If cooking chicken, season one chicken breast with a Poultry Rub. 4. Heat a skillet on medium-high. 5. Cook the chicken breast for one minute. Flip, reduce heat to medium, cover, and cook for ten minutes. 6. Chop your favorite greens, vegetables, and toss it all into a bowl! TIPS: Use cooking spray and to cook your meats instead of heavy oils. You won’t need, or miss, them! • To add more flavor and depth to your vegetables, toss them in a small amount of olive oil, season them with your favorite seasonings, and roast them at 400◦ for 15 minutes. • Top your bowl with Liquid Aminos! It’s a zero-calorie soy sauce alternative that tastes amazing. • To add more superfoods, toss in chopped spinach and kale. • Massage your kale! It takes away the bitterness and brings out incredible aromas and flavors. Becca Mitchell is a Certified Personal Trainer, Self Love Advocate, and Mom of 2. She’s the owner of Becca Mitchell Fitness, specializing in finding balance in fitness, food, and every day life. Becca’s passions lie in helping women find a fitness and nutrition plan that works for their individual goals, and learning how to embrace the beauty and messiness of life through self-care and self-love. With food as one of her self-proclaimed Love Languages, and as a mom of 2 small children, she learns creative (and delicious!) ways to make her family’s favorite meals out of healthy, fueling ingredients. For more on Becca, check out www.beccamitchell.com!